Although found in Seattle’s vibrant Capitol Hill neighborhood, Bar Vacilando still feels like a local’s secret. Far from the hustle and bustle of the Pike-Pine corridor, the restaurant is located up on 15th Avenue East. It’s a surprisingly large space with a dining room and bar, and a separate indoor patio that also looks like an Instagram photo shoot waiting to happen. The folks behind Bar Vacilando are the same owners as Black Bottle Seattle and Bellevue. Dining concepts are similar with an emphasis on bar bites and shared plates. The menu has a mix of American, European, Mediterranean, and Asian inspiration. Here’s what we ordered. We’re suckers for fries, so we couldn’t help but order two different types. 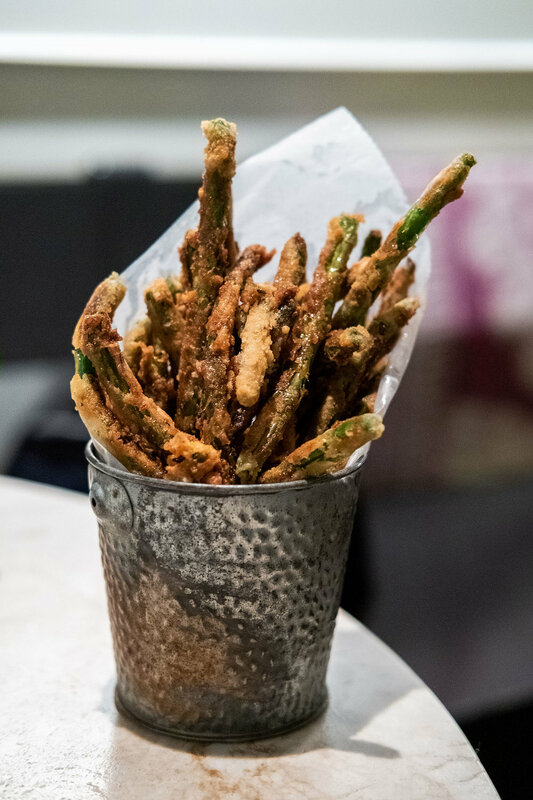 The green bean fries were actual green beens dipped in batter and fried to crispy perfection. Slightly sweet with a nice crunch, these fries paired perfectly with the accompanying jalapeño aioli sauce. We also ordered the scratch fries with za’atar herbs. 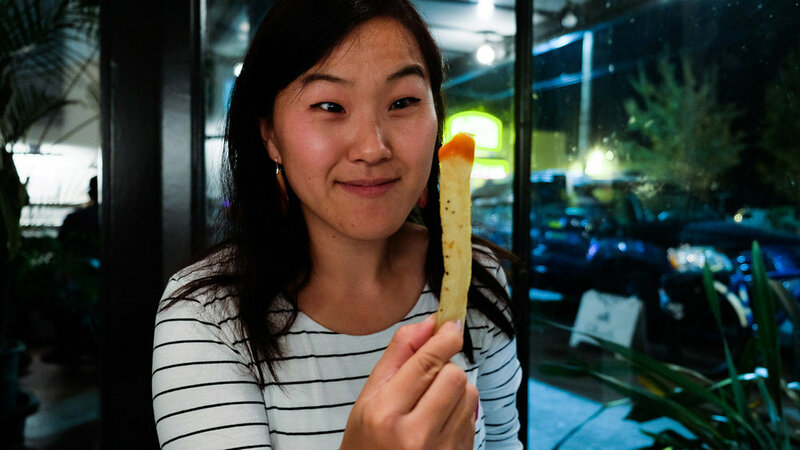 We loved that these fries were thick, piping hot potato slices nicely seasoned with Middle Eastern herbs. Each bite was addictive and kept us nibbling throughout the night. The final appetizer we ordered was broiled shishito peppers. 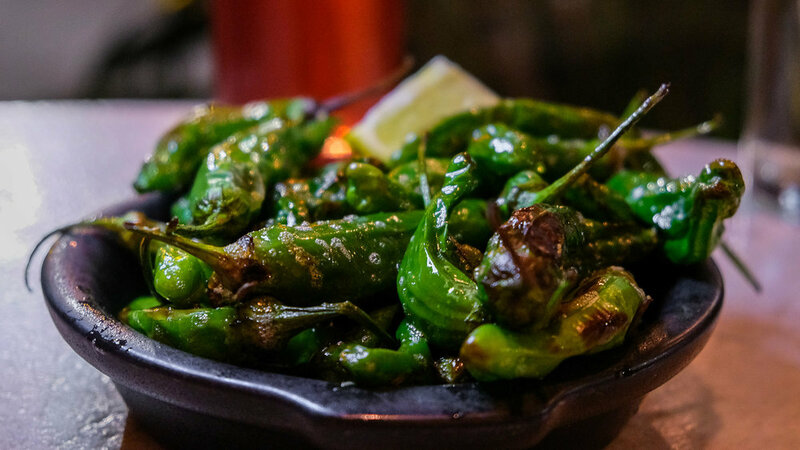 Mild and delicious, these peppers tasted even better with a few squeezes of fresh lemon. Given our mixed Eastern European and Asian ancestries, it only made sense to order dishes that represented our individual ethnic backgrounds. Martin chose the cumin lamb and olive pilaf, a delicious dish that at first glance looked like an Asian stir fry with those bright red peppers. The lamb was tender and perfectly seasoned. We loved the mixed ingredients in the pilaf including the whole chunks of pistachio. The flavor seemed a bit dull, perhaps due to the fact that it was served cold. Not sure if it was supposed to be cold, but this pilaf likely would have been more flavorful if served warm. My dish of choice was the Vietnamese meatballs with stir-fried rice noodles. It was a sizeable portion heavy on the noodles, although the meatballs were also a good size. The dish was well seasoned and very filling—we couldn’t even finish it and had to box it to go. Pro tip—this dish tastes just as good when heated up and eaten as leftovers. The food was so filling that we didn’t have room for dessert, but our server insisted on sending us home with some. This humble slice of white chocolate passion fruit cheesecake ended up being our favorite dish of the night. With a thin, clearly homemade crust, this cheesecake was unlike any we’ve ever had before. The filling was soft yet incredibly rich and more savory than typical cheesecakes. It was the perfect compliment to the sweet, tart passionfruit sauce drizzled on top. Don’t leave Bar Vacilando without eating a slice of this, or taking it to go! 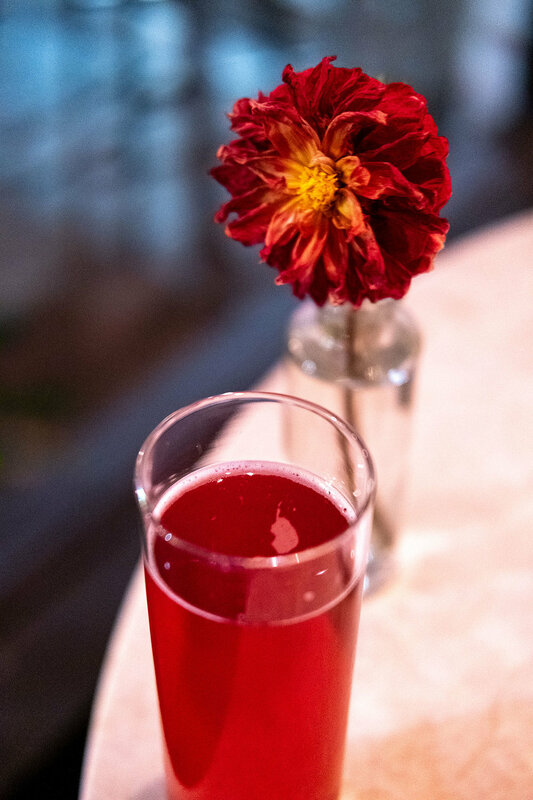 As a non-alcohol drinker, I can’t offer many words on the drinks, but I enjoyed my berry kombucha. The cocktail menu certainly looked intriguing. Think the Sultan Sea (Ghost Owl Rye Grand Marnier, pomegranate, walnut bitters), and Spicy Pepino (cucumber-infused tequila jalapeño, housemade Bloody Mary juice). There are also many wines and beers on tap. I would have loved to see some mocktails on the menu. Don’t miss this gem of a bar and restaurant on Capitol Hill! It’s a great gathering place for socializing with friends or simply getting inspired for planning your next trip!